Marissa and Jon Yeatman gave birth to a healthy baby boy named Nathaniel on Feb. 9, 2018, in Tallahassee, Florida. He was their second child and made their daughter a big sister, a position she was eager to take on. Three days after his birth, Marissa and Jon took their baby to the pediatrician for his newborn checkup, and the doctor noticed an abnormality in the shape of Nathaniel’s skull. “The pediatrician took pretty much one look at him and said, ‘Let’s take some X-rays,’” Marissa said. Though Nathaniel’s head only had a mildly pinched appearance, his abnormal head shape foreshadowed a much more serious problem. Nathaniel was diagnosed with sagittal craniosynostosis, a birth defect in which one of the fibrous joints between the bones of Nathaniel’s skull closed prematurely before his brain was fully formed. “Usually when you look at a newborn’s head on an X-ray, it looks like the skull is kind of shattered, but part of his looked like it was already formed and closed like an adult,” Marissa said. Their pediatrician recommended Lance S. Governale, M.D., UF Health’s chief of pediatric neurosurgery who has a focus in craniosynostosis. The Yeatmans contacted him immediately, hoping to resolve the issue as quickly as possible. 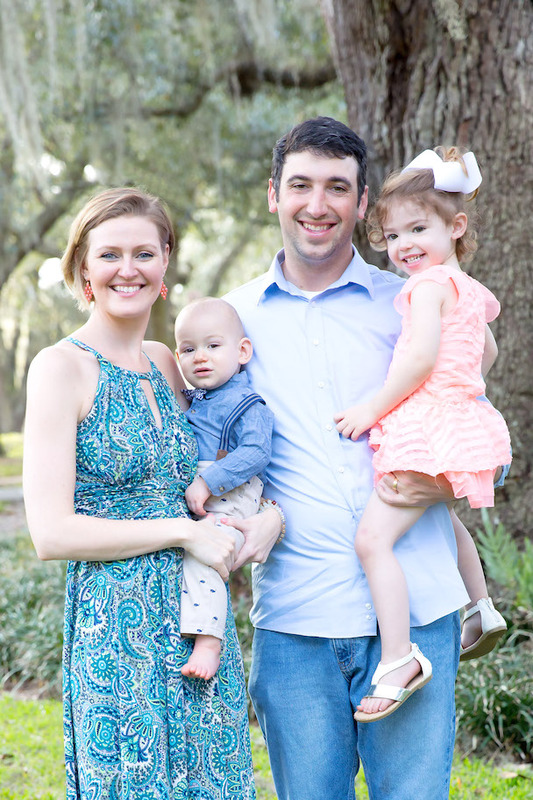 Dr. Governale knew he needed to treat the problem early, so he scheduled the Yeatmans for an appointment close to their home at the UF Health Pediatric Specialties practice in Tallahassee. To gather more information, Dr. Governale obtained a special CT scan. CT scans involve some amount of radiation exposure, but at UF Health’s Gainesville and Tallahassee locations, Dr. Governale introduced ultra- low-dose CT scanning. These scans provide 3D views of the skull at a radiation dose similar to a few X-rays and much lower than standard CT scans. After Nathaniel’s CT scan confirmed the condition, Dr. Governale laid out three different treatment options. Craniosynostosis is typically treated surgically, due to the need to unlock the bones and reshape the skull. The traditional surgery, larger and more invasive, would probably require a blood transfusion and a longer hospital stay, but Dr. Governale was committed to offering minimally invasive options. Because of these issues, Dr. Governale and his pediatric craniofacial plastic surgery partner, Jessica A. Ching, M.D., introduced a second minimally invasive option to UF Health — cranial expander springs. With springs, a helmet is not required. UF Health Shands Children’s Hospital in Gainesville is the only site in Florida offering this newest treatment option. Though she trusted the physician’s expertise, Marissa was relieved to feel as if she wasn’t forced into one specific treatment option for her baby boy. She felt that Dr. Governale let her have the final say. That third, minimally invasive option for Nathaniel was the one that the nervous parents eventually chose. In May of 2018, Nathaniel underwent craniosynostosis surgery with cranial expander spring implantation. Drs. Governale and Ching made one incision, used an endoscope to help open the sealed suture and then put in two cranial expander springs to reshape the skull. Three and a half months later, they went back in and took out the springs, completing the process — no helmet required. A team approach is essential for treating craniosynostosis. The physicians work side-by-side to tailor the treatment to the patient and involve other specialists if needed, including ENT, oral surgery, dentistry, genetics, speech therapy, audiology, psychology and social work. Although Nathaniel did not need those additional specialists, he did have one more added benefit of Dr. Ching’s participation in the surgery — a beautiful closure with minimal scarring, something Marissa and Sean are very thankful for. Today, Nathaniel is a healthy 1-year-old, and you can’t tell there was ever anything wrong with his skull. Nathaniel’s more focused on doing his favorite things, now that he doesn’t have to worry about surgeries or doctors’ visits. His big sister is his greatest source of entertainment. Nathaniel started walking recently and is very mobile. He loves eating and playing with a little lion rattle. The lion has been with him from the day he was born through every surgery after that. Like that little rattle, Marissa and Jon have been there the whole way, too, and have learned a lot through their hardest moments with Nathaniel. Marissa offers advice to other parents who are about to undertake their own harrowing journey with craniosynostosis. She also encourages parents to trust their gut when it comes to health care decisions for their children.